Hi, we only use DHL Worldwide Express for international shipping. We have had problems using other shipping methods in some countries, but DHL has been very reliable with tracking packages and speedy delivery. I am not aware of any other international rates that DHL offer, other than Express. I understand that shipping can be too expensive. That is a good question ! We haven't tried using glass instead of acrylic for our transilluminator. However, you could certainly put your gel onto a small glass plate over the clear acrylic when you are cutting gels to protect the acrylic. You can look for small glass plates online e.g. McMaster-Carr and other stores. We will also have a look at finding some glass plates to recommend with our different transilluminator sizes. If you would like a replacement for your scratched clear acrylic surface, we can send you one, no problem, just let us know and we will happily help with that ! @cireyes Typically turbidity is measured by the light-scatterring properties of the solution rather than absorbance. However, we have used the colorimeter for turbidity measurements and a couple of colorimeter tests (Sulfate and Potassium) are based on turbidity. First, you will need to make a turbidity calibration curve so that you can measure your water sample. 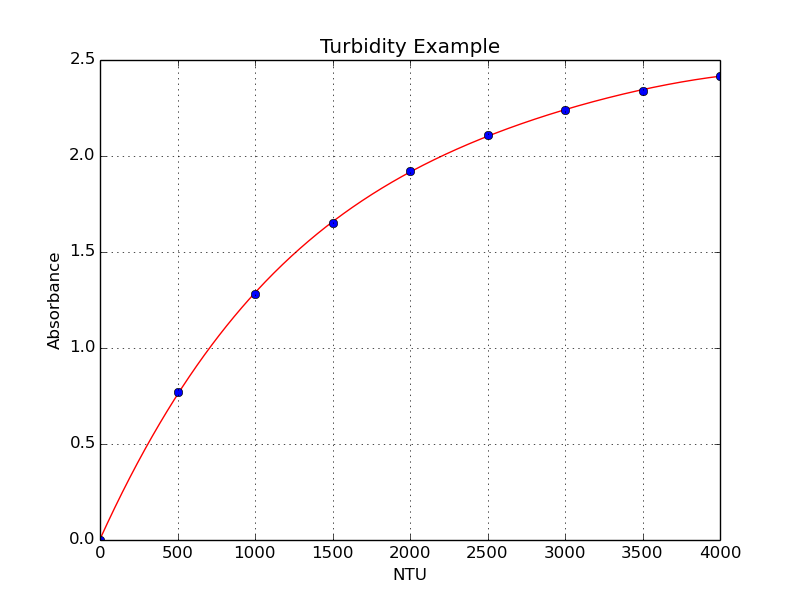 To do this, you will need to buy a turbidity standard of known NTU (Nephelometric Turbidity Units). This turbidity standard is a solution of formazin (suspended polymer particles). You can buy these online from many different suppliers such as Hach etc. I bought a 4,000 NTU standard in 2012 from Grainger, Part # 8UVJ9. Using this NTU standard you can prepare a calibration curve in the range that you want to measure your sample. For example, in the graph below you can see that I made a range of 0 - 4000 NTU by diluting the standard with distilled water. The Red LED on the colorimeter is used to measure absorbance. Once you have your calibration curve, you can measure your water sample to determine turbidity ! @yogeshkd The mini LED transilluminator does fit under the electrophoresis box. I have attached an image for example below. 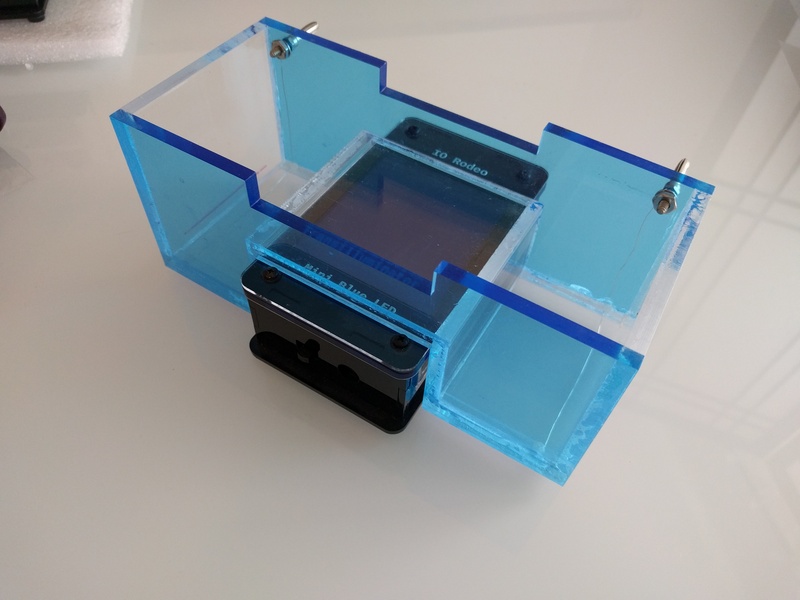 You can use this set-up to visualize gels as they are running if you place the amber lid from the transilluminator onto the gel box lid or use amber glasses. The gel box color does not matter, so you can choose either blue, green or amber. Hope that helps ! We have made custom versions of the LED transilluminator with different LED wavelengths. We just made one with 400 nm LEDs for example, and we have also made one with green LEDs (523 nm). We are planning to make a white light version shortly for viewing/imaging visibly stained gels. As far as the near infra red (700 nm) wavelengths, I don't think we have made this before but it is possible. The trick is finding the right LED. For the transilluminator boards that we use, the LED would need to be a through-hole LED with standard 3 mm or 5 mm LED pin spacing, in the wavelength of your choice and have a viewing angle of 120 degrees or more (for uniform lighting). We will update the BOM shortly as well ! Hi, yes, we can sort you out with a replacement. Please send an email with your order number to jo@iorodeo.com. Thanks ! Today we launched the IO Rodeo Forums as a place to ask us questions and join discussions about our open source lab equipment and projects. Our aim in launching this Forum is that over time it will become a valuable resource for people interested in open source science equipment and DIYBio and grow to become a place to view frequently asked questions and discussions about our products. Hopefully it will also serve as a place to learn about us and what projects we are working on ! While we prefer and encourage general questions about our products on this public Forum, we do also still have a private Contact Form where you can get in touch with us directly for specific questions like quotes requests etc. For those interested, we are using NodeBB Forum Software for this Community. We welcome new Users and look forward to hearing questions and starting discussions on the areas covered in this Forum.